If you’ve checked your calendar lately then you know that Christmas is coming up in a little over a week. How it has come so quickly this year, I don’t know but that’s not the point of the post. I read a recent survey from Deloitte which believes that holiday sales are expected to be up 4.5% from last year to a whopping $986 Billion in sales. Most years my wife and I have played our part in that number. Having three little kids, each other, and extended family to buy for, we’ve more than made up for our share. That’s not to say we couldn’t afford it, per se, as we always budget throughout the year for the amount we’re going to be spending. However, as we’ve looked back over the past few years of exchanging Christmas gifts, we’ve noticed we’re really just going through the motions. So, we decided to go against the grain this year. Our decision not to exchange Christmas gifts this year has nothing to do with us loving each other any less. Heck, after 13 years of marriage I’ve never loved my wife more. Just like Grayson said earlier this year when in relation to Valentine’s Day, I don’t need a calendar to tell me when to show my wife I love her. The same thing applies with us for Christmas. But, that’s only half of it. The other half of our decision, and honestly the bulk of it, is we’re seeing that we’ve just been wasting our money the past couple of years. Yes, the money has been budgeted and we have it there to spend but if it’s on something that’s simply not bringing us value or that we’re not enjoying then it’s simply just more stuff…(cough cough…crap…cough cough) that we simply don’t need. I know it would be easy to think this is part of me just not being a fan of the Holidays. But that’s honestly not the issue. As we look back over the past several years the gifts we’ve given each other, none of them are memorable. I think a big part of that goes back to us already having what we need and if there’s something we want we simply budget for it and go out and buy it. After some discussion about it we just decided to stop going through the motions this year and relieve ourselves of the stress of coming up with Christmas gift ideas for each other. Before you go and think I’m being a big Scrooge and throwing the towel in on the holiday altogether, give me a chance to tell you the rest of the story. We’re still coming up with a few Christmas gift ideas for our kids and will be putting over half of what we budget for them in their college savings accounts. They get enough stuff from our parents so there’s no sense just to overwhelm them with gifts. We’ll also be giving to those in our family we’ve agreed to exchange Christmas gifts with. Thus, the change is really only with what my wife and I are doing between each other. We typically budget $150 a piece to buy Christmas gifts for each other each year. We stayed with that same number this year so we have an extra $300 to do something with now. After some discussion we came down to two options. The first is having a date weekend here in Omaha. As any parent of little ones knows it can be extremely difficult to have a date night at times. That’s also not to mention the fact sleep filled nights are few and far between. As a result, we value being able to have a night to ourselves and getting a full night’s sleep. Not exchanging Christmas gifts this year would allow us to stay the night in a relatively nice hotel here in town, enjoy a meal out and have a sitter stay here to watch the kids overnight. That is something we’d get much more enjoyment and value out of as opposed to some unnecessary trinkets. The other option we’re looking at, and probably a little more seriously, is using the $300 and combining it with some credit card rewards points and enjoying a short weekend trip as a family later in the Spring. We can get to a wide variety of different cities in the Midwest and have more than enough points to score 2-3 nights in a hotel without breaking a sweat. The extra $300 would more than cover gas and money we’d need to have dinners out. We’re leaning towards this option as it would allow us to enjoy some time together as a family and do a little traveling. On one hand this was a difficult decision for Mrs. Frugal Rules and I to make. We like to give each other gifts, especially at Christmas. On the other hand though it was an incredibly easy decision to make. We see what we’ve bought each other the past few years and nothing stands out. Since we follow a values based spending philosophy it made sense to change things up some and use the budgeted money for something we’d actually enjoy instead of just bringing more stuff in the house we don’t need. 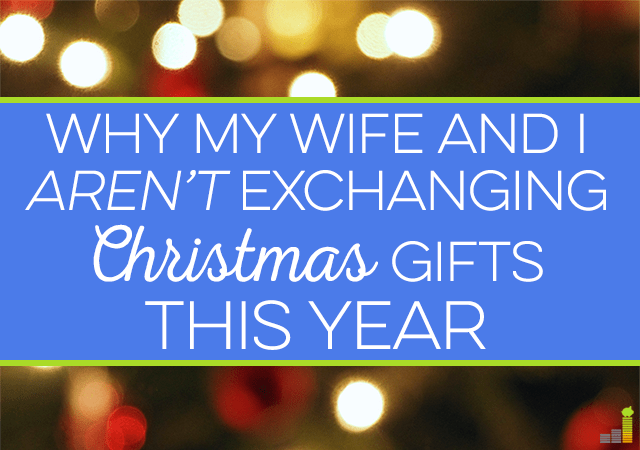 Have you and your partner ever decided not to exchange Christmas gifts? What did you do with the money instead? Do you budget for your Christmas spending? If you were us, would you use the money for a date weekend or a family weekend trip? I feel so sad about that. I and my wife always surprise each other every year. I feel it’s once a year, so we’d better celebrate it and do exchanging gifts. I am just glad that wife easily find happiness even in small things. Taking the trip together sounds really nice; and smart if you’ve got the credit card points. Whenever we can my wife and I prefer to take short just-us vacations rather than exchange gifts. I love the idea! :) But maybe you can still get each other gifts but make it challenging by setting a $5 limit! Honestly, I don’t know if my hubs will give me a Christmas gift because last Christmas he surprised me a new Samsung S3. I think, I will just give him a new pair of long sleeves. Sounds like a nice surprise! With love I don’t think it really matters. You have each other, the same financial goals, and thats more than enough. In fact you both could just write each other a poem or a love letter and exchange it. To me that would be so sweet and still priceless. Completely agreed. We love each other and have the same goals so it really doesn’t matter. Good idea, that would mean a lot more than spending on something we don’t need. Perfect ideas! Mr. Frugalwoods and I usually don’t exchange gifts either (for Christmas, birthdays, Valentine’s day, etc). We always discuss in advance so that we’re on the same page, but, we’d much rather save the money. Taking a little weekend trip together is far more valuable to us than buying each other random stuff because the calendar says to. And I agree with you–doesn’t mean we love each other any less, in fact, I think it’s quite the opposite. Thanks for sharing this :)! Thanks Mrs. FW! Great point on getting on the same page as the last thing you want is to hurt the other’s feelings when you weren’t intending to. The last few years we have dramatically decreased the gifts we give to each other to the point that we only exchange 2 or 3 small gifts and they are practical things like gloves and scarves. We really don’t need anything and hate the waste of spending money just to spend it. We are like you, we love each other all year and don’t need to have presents under the tree to confirm it. I think that’s the point we’re likely going to come to ourselves. We’ve just gone through the motions the past few years and just wasted money. I like the idea of getting one or two things the other might like or have need for and leaving it at that. We usually don’t buy for each other either. We have most things we want and I don’t enjoy gifts of flowers or massages or anything like that. And since we share money, it seems pretty pointless to buy each other gifts for the hell of it. I agree, there’s no point to just spend money for the hell of it. That’s just a waste of money! We came this close (holding thumb and forefinger 1/2 inch apart) from deciding to not exchange gifts this year. But we both decided that it is a tradition we really enjoy and since our son isn’t with us on Christmas day any more, it would end up being just another day. So we exchange, enjoy and don’t feel apologetic about having more stuff. We always ask for things that we will use. Well, I just purchased a lot of spray foam insulation and paid our property taxes, so this Christmas our gifts are going to be hugs! I’m not a big fan of gifts for Christmas. I used to love getting gifts, but my materialistic side went away when I paid off my debt. Ha ha, nothing says Merry Christmas like property taxes and spray foam insulation. 😉 Seriously though, we’re in the same boat. Sounds like a great idea! When I look back on my life, it wasn’t the presents and the stuff that made me happy, but the experiences! Yep, exactly! Most stuff will just break down at some point and I’d much rather have the memories/experience. I say go for date night. My boyfriend and I did something similar for our birthdays this year. Instead of exchanging gifts, we used the money to help finance a vacation together. We VERY seriously considered not exchanging gifts between the two of us this year. In the end, we decided that we should in fact do something small in order to set an example for Mini Maroon #1. At almost three, we figure this is a pretty critical year to establish what Christmas is all about to him. Watching his parents exchange gifts, thoughtful and useful gifts, should be part of that too. We will likely cut it out at some point in the future once this minis get older. But for now, teaching them about giving is an important part of our Christmas traditions. I can totally see that Mrs. Maroon. We’ll surprise each other with a few things throughout the year so we can get the same basic thing that way. Wes and I don’t usually exchange presents, and we aren’t doing anything this year either. I’d much rather have a fun date night and/or an experience! I would as well, especially when it’s so infrequent as it is! We just bought some new clothes for family pictures and I’m calling that Christmas gifts. We usually do things like stocking stuffers, but I can’t think of a single thing I need or really even want this year. I’d much rather take a trip than spend on a gift I don’t need. We’re in the same boat Kim. When we thought about it, there just isn’t anything we really want or need, other than extra time together. My husband and I get each other gifts occasionally. We try to build in fun things together throughout the year, and with so much money going out the door and new things coming in at Christmas, we normally skip Christmas gifts for each other. We’ll do that once or twice a year as well and it does just make it somewhat needless this time of the year. We feel like we already bought some big things we wanted earlier in the year, so we agreed to keep it to $30 each. It doesn’t help that our anniversary is 3 days before Christmas. Our 14th anniversay is 12/29. Believe it or not, with it being between Christmas and New Years gitend to forget our anniversary until the day before or after. To me, this means we shouldn’t exchange Christmas gifts and we should make our anniversay to take time to spend with each other. We have 4 grandchildren and a new one due in January so we enjoy giving the children gifts at Christmas. We are going to look for a Group On deal to take time to be with each other this year even if it’s dinner and a movie. As for Christmas, my husband is getting socks and a new Carhart hat and quality time with the family. I believe he is getting me a small mirror for the bathroom which is something I need. That’s it for us, time with family on Christmas, gifts for the grandchildren, none for our adult children, and time together for our anniversary. My wife and I spent a lot on birthdays and Christmas when we were dating. Part of it is that we 1) didn’t have much at that time, so it was easy to find things to buy and 2) we are terrible at buying bigger things for ourselves, leading to us never ‘treating’ ourselves to bigger purchases. But that’s no more. This year we are doing a $20 limit on stocking stuffers and that’s it! That’s a bit misleading because we actually did choose to do an event instead. We went to the Nutcracker (the Moscow Ballet was in town for one day here in Minneapolis) and it was definitely worth it. I think a lot of people are that way when they’re dating someone seriously, at least I know we were. I remember you mentioning going to see that – it’s definitely something we’d do as opposed to just spending on stuff. I would take the short weekend trip if I were you. We’re definitely leaning that way. I love your two ideas. I don’t want/need many gifts or things this Christmas either. In fact I keep telling my parents (my mom especially) that I don’t want gifts that will just end up as clutter. Then yesterday in Walmart she was like “OMG we should all have yo-yos in our stockings” and I said “No, that would be a clutter gift to me”. Ha ha, sounds exactly like my Mom! I know the thought is there but it usually just ends up being wasteful. We’ve spent more years together as married without kids and during that time we did buy each other fairly extravagant Christmas presents, often times choosing to go on really nice vacations. Now we still exchange gifts, but like you, our focus and gift budget goes towards others. We still get each other something but nothing fancy. If we choose to give one another a more extravagant type of gift, we typically do it on our anniversary since that is solely for us. 🙂 I love the idea of using the money on something like a nice night out (date nights are so special these days!) or a weekend away. That’s a real gift! We’ve moved very much that way Shannon – of doing something nicer for our anniversary. It has more meaning to us and isn’t during the craziness of the holidays. I agree, that is a real gift and something we’d appreciate much more. We budget for limited holiday spending. But we either set a low limit on gifts for each other, or like your date night idea we do something together (or buy something together for our home). There are so many non-monetary gifts we give each other that there’s not really a need for more. I think you made a smart decision about what works for you and the Mrs. and either option (date night or trip) sounds like a winner. Great points Gary! I agree, we give each other numerous non-monetary gifts that much else really isn’t needed. Have you considered surprising her by tackling a big and/or unpleasant chore? Good suggestion – I do that from time to time as I know she appreciates it. We decided not to exchange gifts this year. Instead we are going on a short vacation over the holidays. I was surprised when we approached the kids with this idea back in October. They were 100% for it. Makes you wonder how much giving a present to them at Christmas really means. They didn’t seem too disappointed not to be receiving any from us. That’s awesome Brian – it speaks a lot to your family I believe. Our kids are a bit young to be there now, but hopefully will be in the next few years. Oh man, my wife and I tried to do that last Christmas and my co-workers shamed me into getting something. They made me out to be a horrible husband for even contemplating this and that even if my wife said she didn’t want to exchange gifts, she doesn’t mean it. And part of me felt that my wife did like getting something…just not anything extravagant (My co-workers encouraged me to go to Tiffany’s!) So I got my wife her favorite cookies and a book I thought she would enjoy. Definitely no big purchases like my co-workers. It really makes no sense since we have joint accounts and we discuss all big purchases. Ha ha, I can only imagine what it’d be like if I were still in an office – probably much like your experience. I think it just goes to show you what others put value in. I know my wife still likes to receive gift, heck who doesn’t, but we value time together much more at this moment in our lives. I didn’t want to exchange gifts this year but I think I missed the boat so I will see if I can implement next year. last year’s gift though was maybe a start in a tradition. I gave my husband a gift to have monthly date. With two kids I know you know how it is to have some time alone. So if I were you I do the date night. Except with $300 I could definitely see that being able to cover multiple dates. I agree, those date nights are precious and far between unfortunately. $300 would only cover us for one night though. We’d need a hotel (and would want somewhere relatively nice) a new dinner out and a sitter to watch our 3 little ones for the evening and part of the next day so we’d likely eat all that $300 up. The sleep alone would be worth it! I think you two are adorable and totally deserve the date night just the two of you! It’s often the gifts which cost little to nothing that mean the most. Agreed, either option is better than simply wasting money. Great post, John! 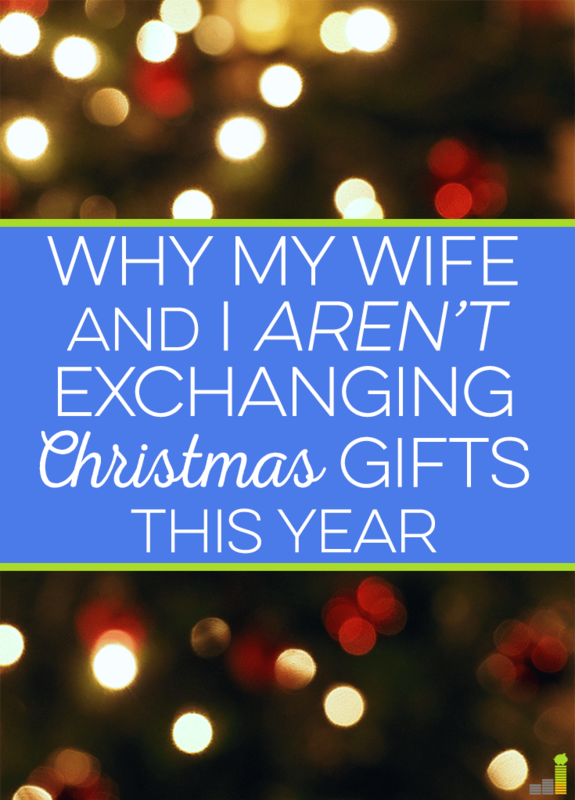 My husband and I aren’t exchanging gifts this year either, for similar reasons as you and your wife. We also decided our combined Christmas gift is paying off our car – we sent the last check in during November and received the title recently. An extra $600 a month in the bank account is gift enough. Happy Holidays to you and yours! Thanks Kendal! Nice work on the extra $600/month – that’s some serious cash you can do quite a bit with. 🙂 To you as well!